I think of snail like a "level" of Asian beauty - you haven't really dipped your toes in until you've slathered some snail mucin on your face. Snail mucin is good for regeneration of the skin - scarring, collagen loss, acne, irritation... these are all things that can use help in healing. 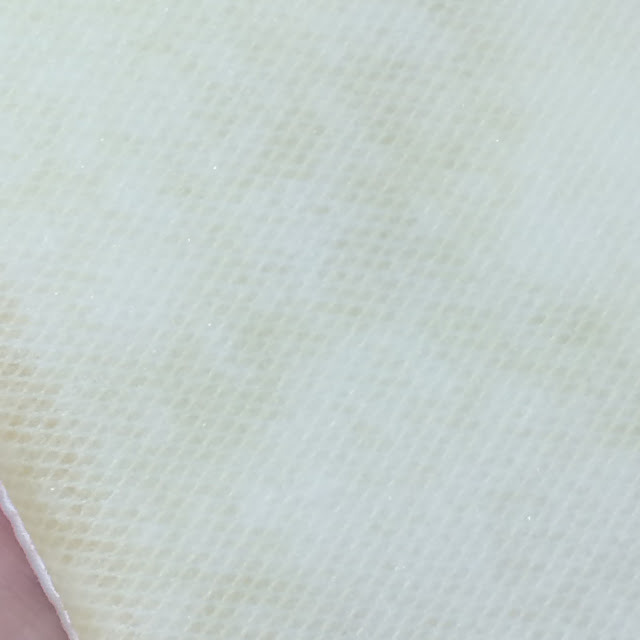 I trust buying snail products from Cosrx, because they gather mucin without harming any snails - they simply crawl around on netting and the mucin is gathered at it drips down. Cosrx currently makes three snail-based products, the mask being the newest, and the essence and cream being fairly well known by now. In this post I'll compare the ingredients of all three and tell you a bit about each of them individually. 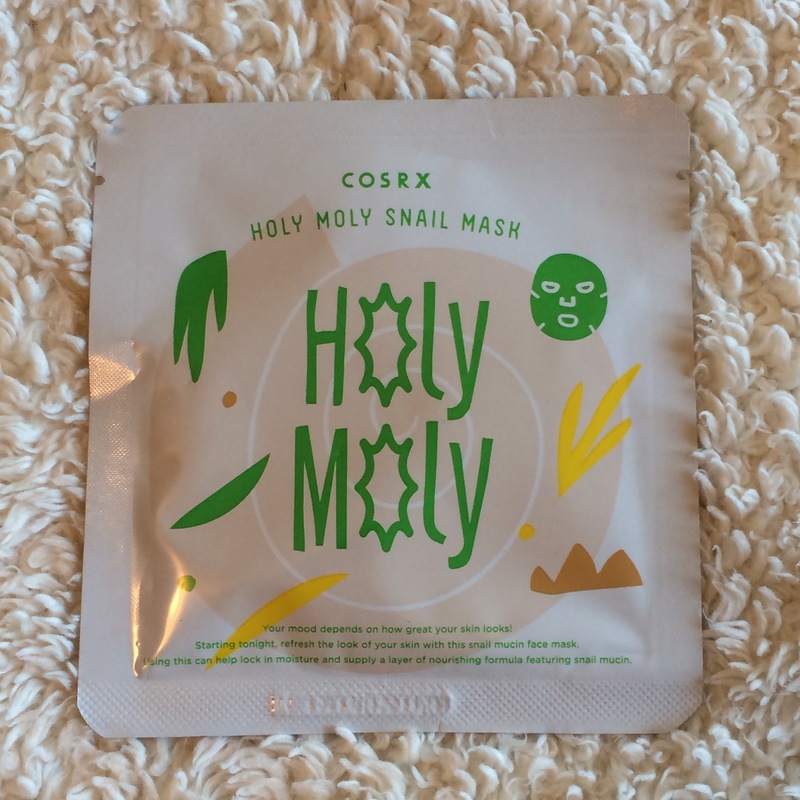 The Cosrx Holy Moly Snail Mask was just released a few months ago, and I was blessed to have Cosrx send me a few to try out. Of course by now I've been purchasing more, as they've quickly become my current favorite sheet mask. Cosrx uses red ginseng water instead of plain water in this mask, which contains antioxidants and prevents further damage to the skin. Snail is the second ingredient on the list, offering deep hydration and soothing effects to the skin. The mask material is soft with a bit of stretch. The essence is a bit slimy, but not sticky, with a very light scent. I appreciate the plumping and hydrating effects this mask has on my skin. It's calming and moisturizing - a real winner for all skin types. Ingredients: Red Ginseng Water, Snail Secretion Filtrate, Methylpropanediol, Butylene Glycol, Glycerin, 1,2-Hexanediol, Allantoin, Hydroxyethyl Acrylate/Sodium Acryloyldimethyl Taurate Copolymer, Sodium Polyacrylate, Sodium Hyaluronate, Carbomer, Arginine, Ethylhexylglycerin, Phenoxyethanol. The Cosrx Advanced Snail 96 Mucin Power Essence contains 96% snail mucin filtrate, and is designed to hydrate and repair elasticity in the skin. It's sticky and viscous in texture, clear in color, and has no scent. This is such a deeply hydrating product, that I often find it to be too heavy for my oily skin during the daytime in the summer - this is more of a night-time and winter-time product for me. My favorite use for this essence is my neck, however, as it helps keep the skin there tight and not saggy. 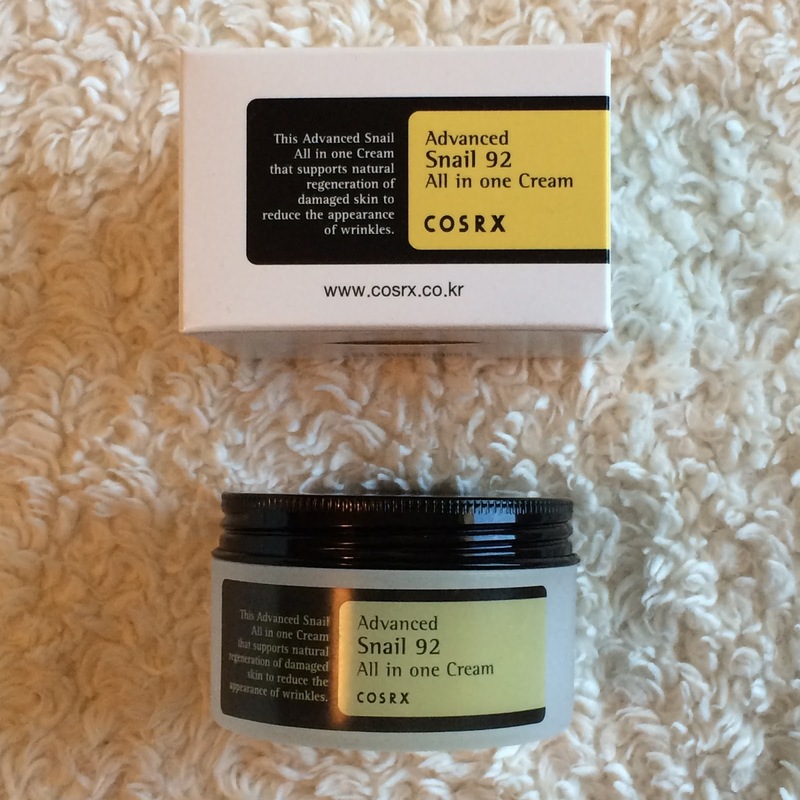 The Cosrx Advanced Snail 92 All-In-One Cream contains 92% snail mucin filtrate, and is designed to soothe and lightly hydrate the skin while providing anti-aging benefits as well. This cream is very lightweight and runny in texture, has a creamy white color, and a barely-there scent. This is a very lightweight moisturizer that I would see suitable for all skin types. 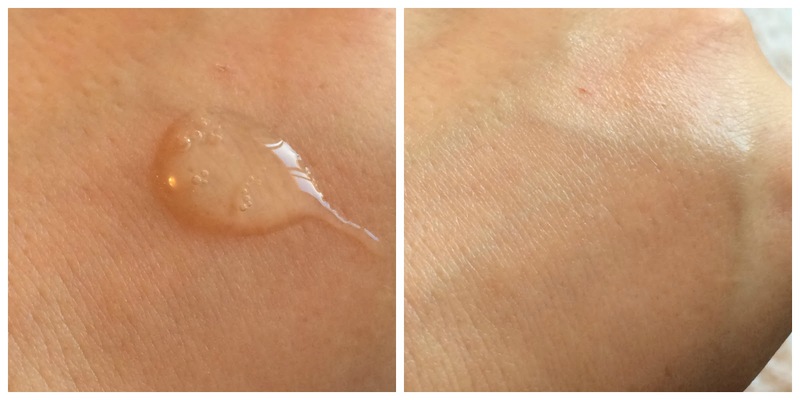 Oily skin will appreciate the benefit of snail mucin while not being greasy or overbearing, while dry skin would find this to be a suitable alternative to a lotion before a heavier moisturizer, or even a soothing hydrator to use before makeup. 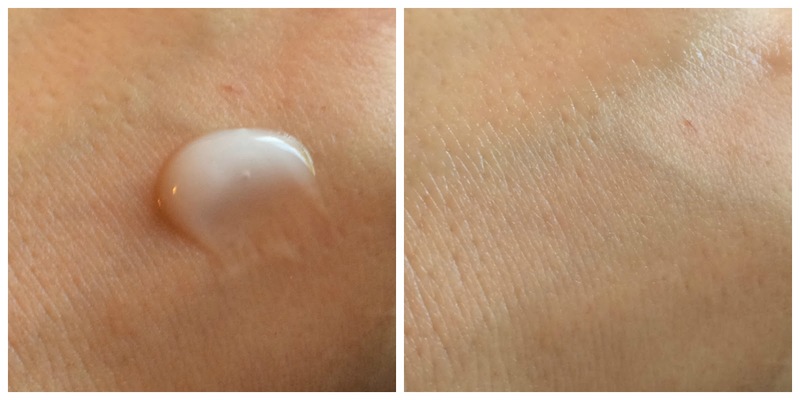 This is a cream that I find perfect for my oily skin both day and night, year-round. Ingredients: Snail Secretion Filtrate, Betaine, Caprylic/Capric Triglyceride, Cetearyl Olivate, Sorbitan Olivate, Sodium Hyaluronate, Cetearyl Alcohol, Stearic acid, Arginine, Dimethicone, Carbomer, Panthenol, Allantoin, Sodium Polyacrylate, Xanthan Gum, Ethyl Hexanediol, Adenosine, Phenoxyethanol. Can you believe today is the first day of Autumn? I decided today would be a good day to open up sign-ups to my annual "All I Want For Xmas Is Asian Beauty" Giveaway Blog Hop! The past two years some wonderful Asian beauty bloggers along with myself have hosted some giveaways to bring in some holiday cheer. This years' hop will open on November 18th (with posts to be up by November 22nd at the latest) and giveaways will close on December 2nd. You have until November 11th to sign up to be included in the giveaway linky, so you have plenty of time to plan your giveaway. Please read through the top of the embedded form below for full details, and to join the giveaway hop. Please don't hesitate to email me at gothickornchic [at] gmail . com if you have any questions. Jini Beauty is a bi-monthly subscription service that offers Korean beauty products - not just a "one and done" type of subscription box, but an offering of four different boxes for different skin types every other month to ensure you're receiving products that designed to work with your skin. When signing up for a Jini Beauty subscription you'll be able to choose between Dry/Mature, Normal/Combination, Oily/Acne, and Sensitive/Troubled skin types. 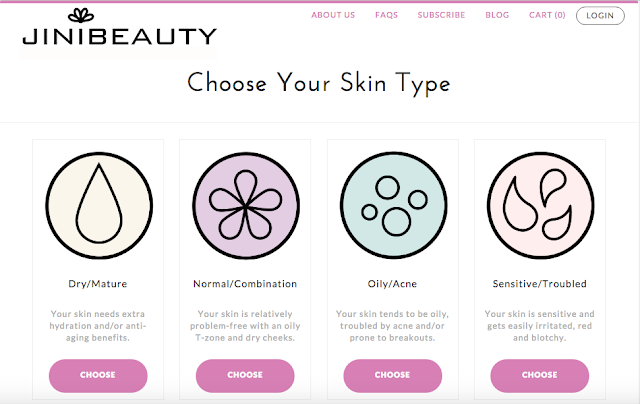 Don't worry if you're unsure what type fits your skin best, because they're easy to understand descriptions by each skin type. You can also change your skin type at any time, if you think another box would fit your skin better later on. Each box contains 6-8 full size products and/or deluxe samples, 2 sheet masks, and complimentary sample packets. 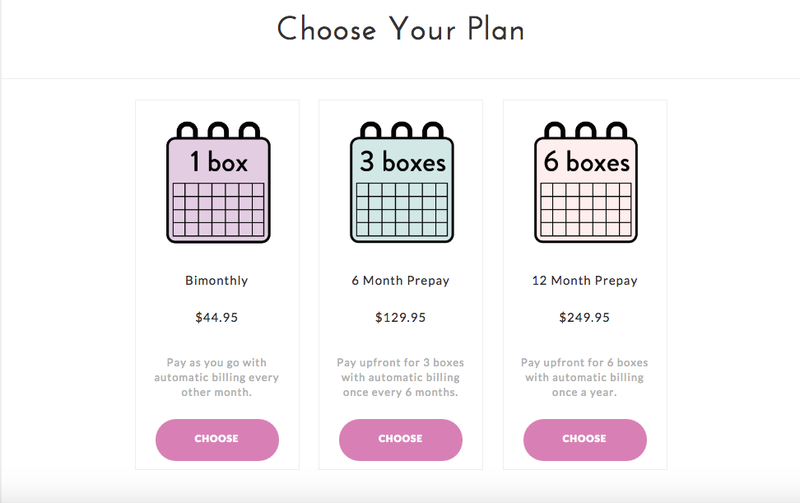 Pricing starts at $44.95 bi-monthly (coming out to less than $22.50 a month), $129.95 for 3 boxes (6 months) prepaid, or $249.95 for 6 boxes (12 months) prepaid. Shipping is free within the US, and $8 to Canada. Jini Beauty is working on expanding shipping to other countries as well, so keep an eye out! 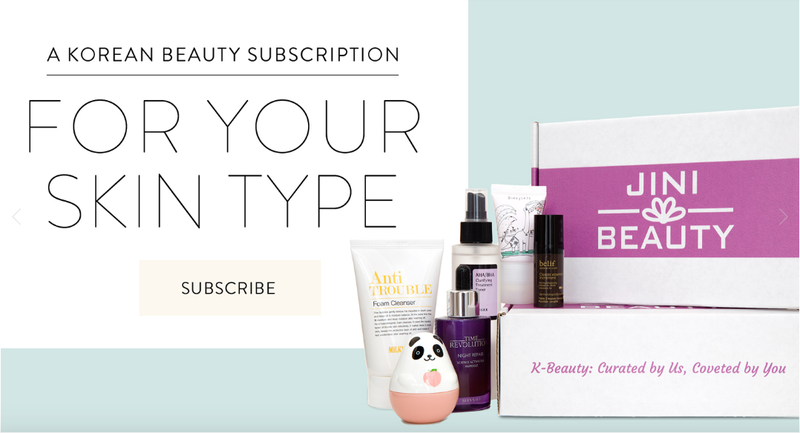 All subscribers receiving the September/October box will be entered into a big giveaway, so make sure to follow @jinibeautybox on Instagram for upcoming details. I was sent the August Jini Beauty Box complimentary to share my unboxing with you, and my opinion of the products inside. So lets get started! Card Description: Give your feet some instant TLC from wearing those cute sandals all summer and slip on this moisturizing foot mask ASAP. Designed like socks, the mask contains aloe vera, beeswax, and ceramide to deliver intense hydration to cracked and calloused feet. Directions: Wash and dry feet. Open package and divide the mask in half along the dotted line. Put on the mask like socks and use the stickers to wrap and secure the mask around your angles. Leave on for 20-30 minutes. My First Impressions: I've used many foot masks in the past, both peeling and moisturizing, and for the most part I enjoy them - this was no exception. For me, summer = barefoot, so my feet are in a pretty sorry state by the end of the warm weather season. This mask fit well (no struggling or pinching to get it situated on my size 10 feet) and after an hour my feet were greasy but the cracks on my soles were smooth. By morning my feet were buttery soft. A tip for those interested in foot masks - I like to keep a pair of slipper socks around to wear on top of a foot mask, so I can still walk around and not slide on the floor. Card Description: Say goodbye to dull, flaky lips with this moisturizing lip scrub. Vitamin A and flower essence keep lips hydrated while tiny beads made from walnut provide delicate exfoliation. This little tube of scrub will soon become your lips' best friend. Directions: (1-2x per week) Wet lips and apply a small amount of the scrub. Use your finger or a toothbrush to gently exfoliate lips, then wash off with a wet cloth. My First Impressions: This is a very creamy lip scrub with very fine particles for scrubbing - it's not especially abrasive, in fact it's quite gentle and I honestly use it every evening instead of twice a week. It's a bit sweet smelling, and leaves my lips soft and hydrated. I really appreciate the tube packaging, it's very easy to apply this way. Card Description: This ampoule consists of activated deep sea water from the Donghae Sea to lock in concentrated moisture, along with carbohydrate complex, papain enzyme, and white lotus extract. It also restores texture and promotes healthy, glowing skin for visible anti-aging effects. 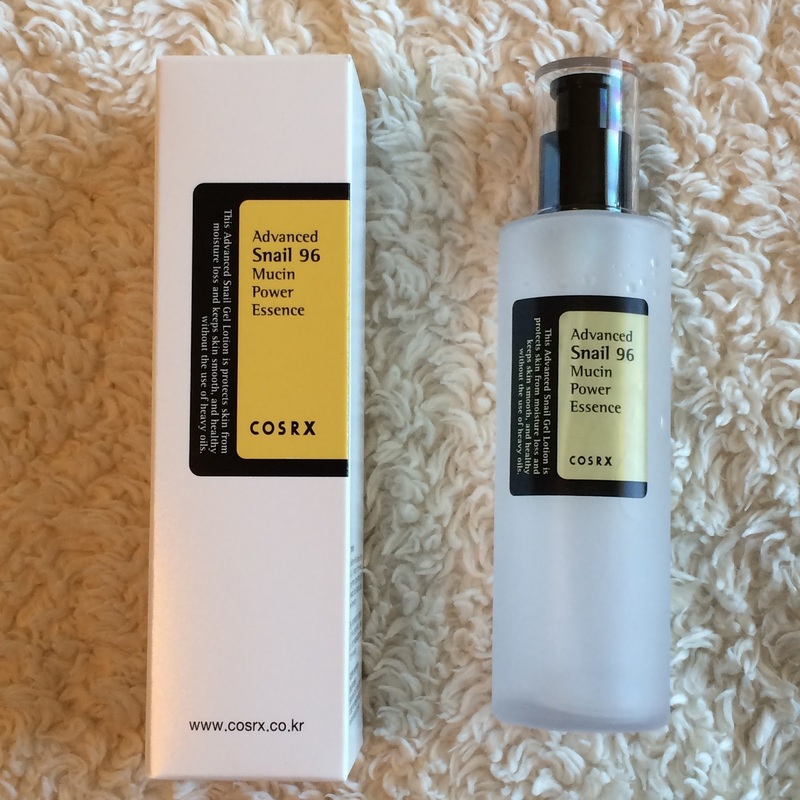 Directions: (after toner and before essence or serum) Dispense the ampoule onto a cotton pad and gently press over face. 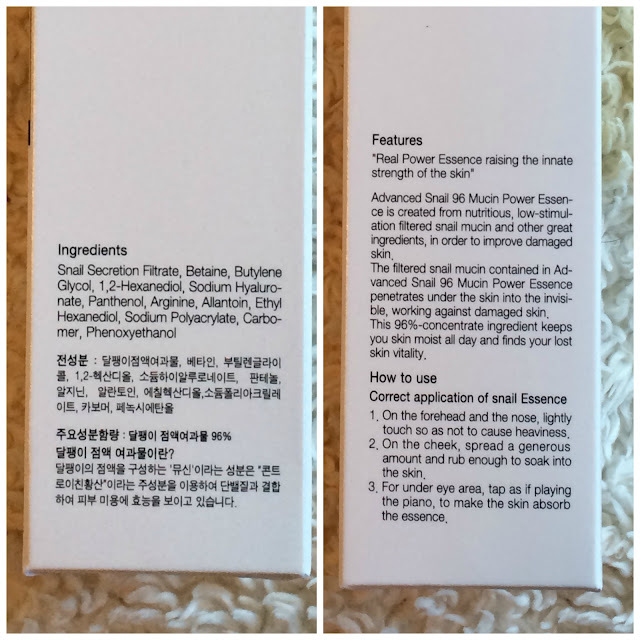 My First Impressions: I was immediately drawn to the tiny glass bottle in this box, and of course "marine" caught my attention right away, so I was deeply saddened when I used it once and found that my skin looked visibly brighter after use and that there was so little left to use. 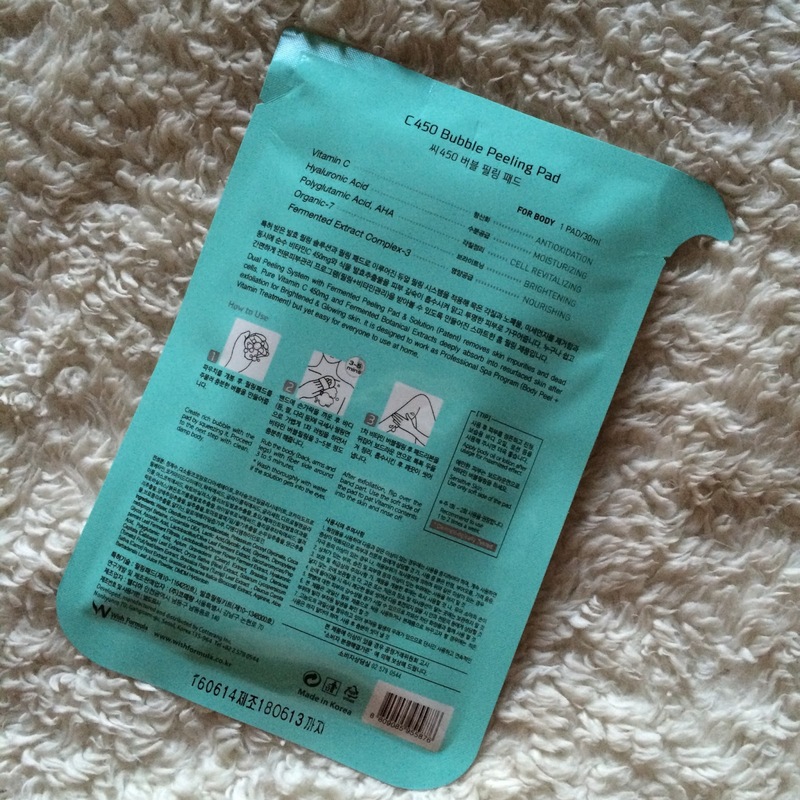 There is no scent to this item, another plus, and it absorbs immediately into the skin. Card Description: These cucumber-shaped pads are pre-moistened in cucumber, mulberry root, licorice extract, and other natural ingredients to deliver soothing and cooling effects. The pads are specially designed to rest easily on your face, so simple close your tired, stressed eyes while you sit back and relax. Directions: (any time after cleansers) Place the pads over eyes or another area of your face and leave on for 10-15 minutes. Store in your refrigerator beforehand to enhance the cooling sensation. My First Impressions: Another familiar product for me - I've gotten several full size jars of these and the orange variety in past Memeboxes. 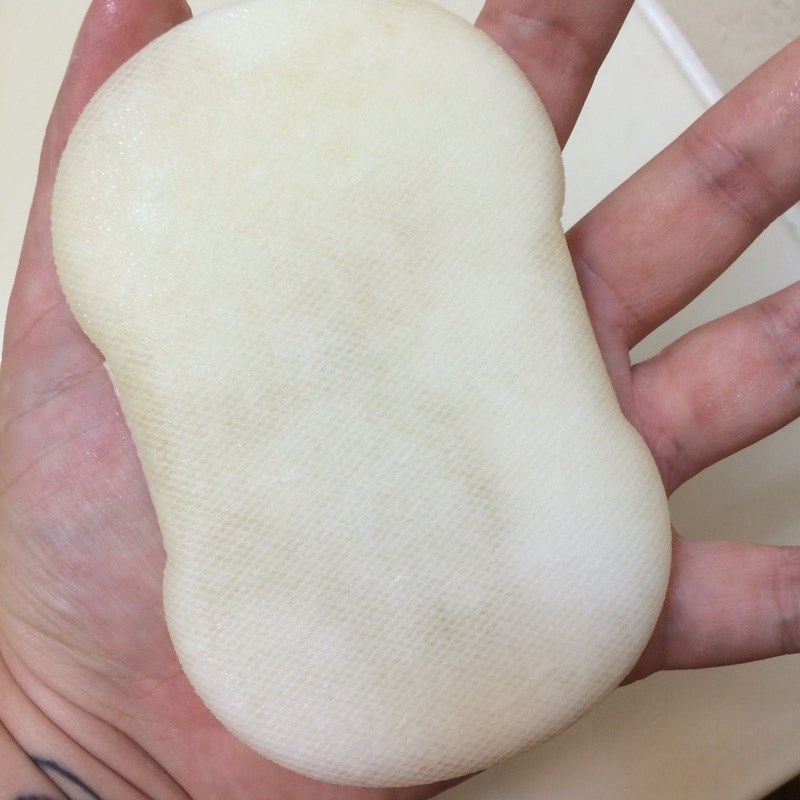 These are my favorite brand of spot pads, and while these do not do the best job sticking to the eye area unless you're lying down, they are also cooling for irritated areas like cheeks. I personally like them when I have a headache, and stick them on my eyes after chilling them in the fridge and lying on the couch. They are soothing, and don't have a very strong scent. And they are saturated in essence. Card Description: This rich hydrating cream is perfect for sensitive, acne prone skin that needs some tender loving wrinkle care. It contains 30% hyaluronic acid, tree sap, and bamboo to deeply sooth, nourish, and moisturize skin while preventing aging and sagging through firming, lifting, and tightening properties. The cream is free from fragrance, artificial color, and parabens! Directions: (last step before spf) Lightly rub or massage a small amount of the cream into skin until fully absorbed. 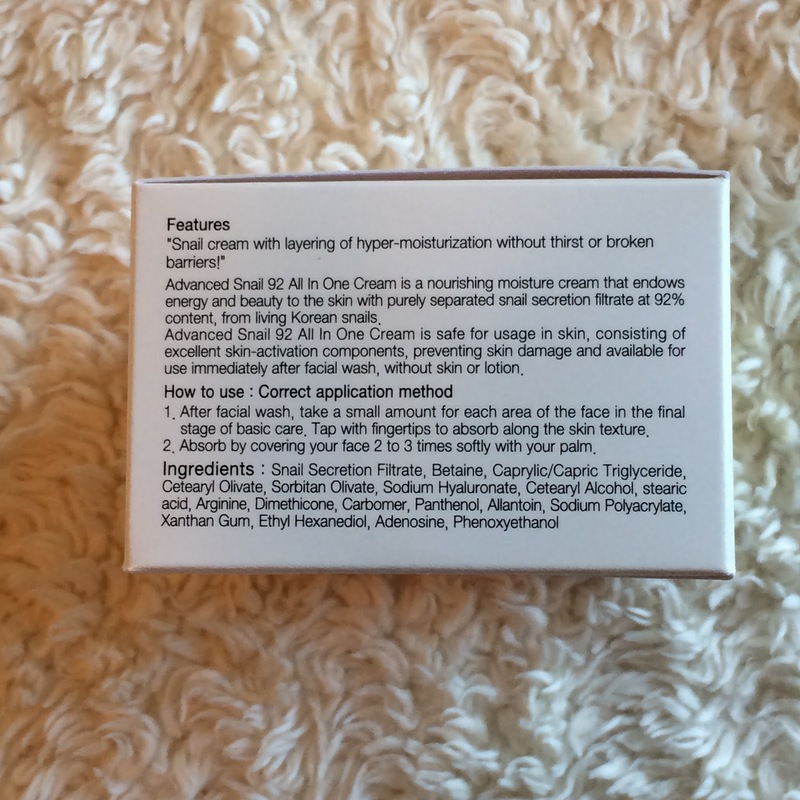 My First Impressions: I am a fan of the Mizon Repairing Snail Gel Cream, so when a new variety tube showed up in this box I was excited to try it out. This is a pretty lightweight cream, and I love that it's in a tube - I don't mind tubs, but they can be a bit more of a hassle to work with when you're in a hurry, or just plain clumsy like I am. 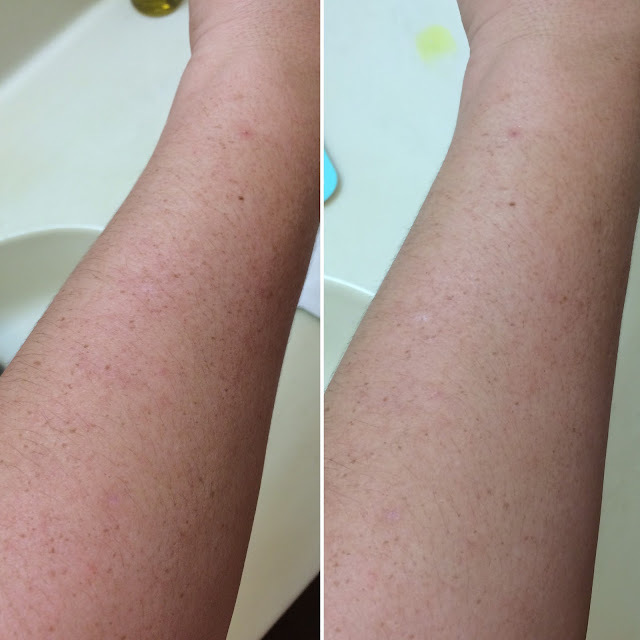 This is a very hydrating cream, but it doesn't leave my skin greasy at all, so I'm very happy with it. So far I haven't broken out from it either, so I have no complaints! 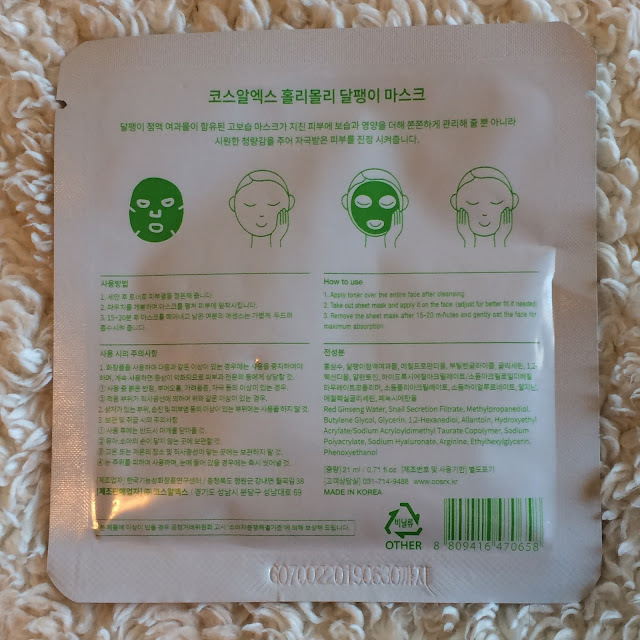 Card Description: This sheet mask from illi's regular hanbang (Oriental medicine) series features mugwort for soothing and calming effects. Mugwort extract is rich in amino acids and serves as a powerful anti-inflamitory agent that reduces redness and irritation. Directions: (after toner) Unfold mask and carefully adhere to face. 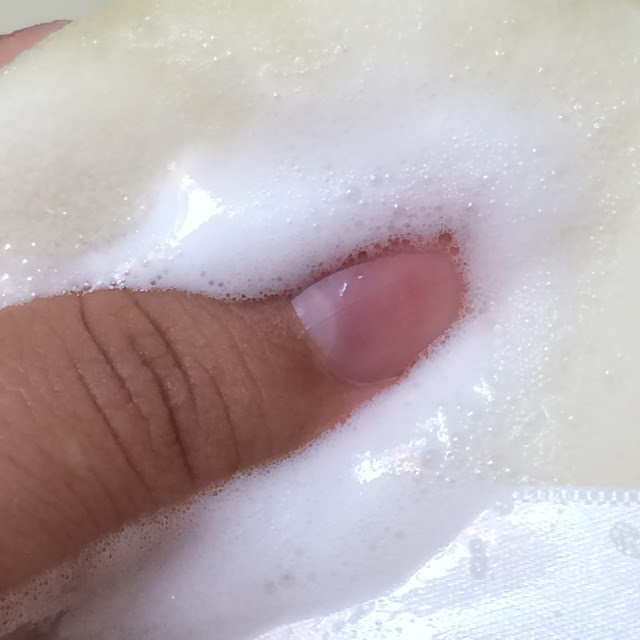 Leave on for 15 minutes or longer, then pat any remaining essence into skin for additional absorption. 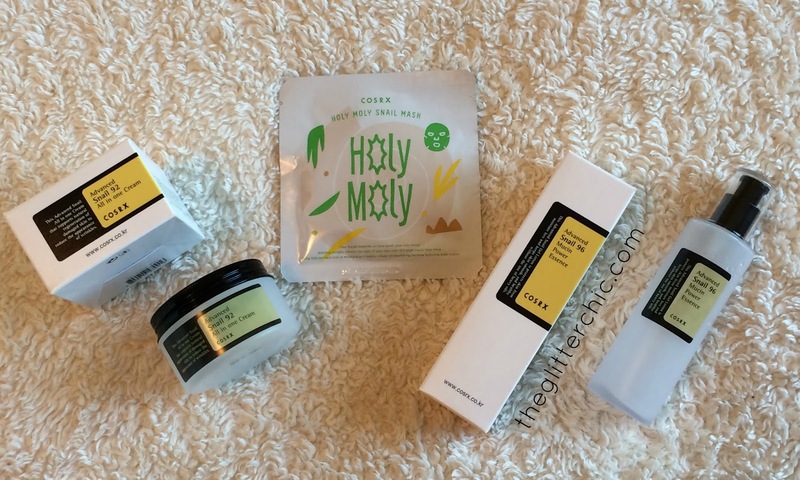 My First Impressions: I love sheet masks, so I was thrilled to see one in this box, especially illi! This mask has a bit of a minty pine scent - very herbal and awakening. The essence is watery and the mask itself is cotton paper. It fits well but leaves bubbles where there are curves in my face. The paper is a bit too stiff to conform perfectly. The mask stayed damp for about 20 minutes before it dried out enough to be removed. 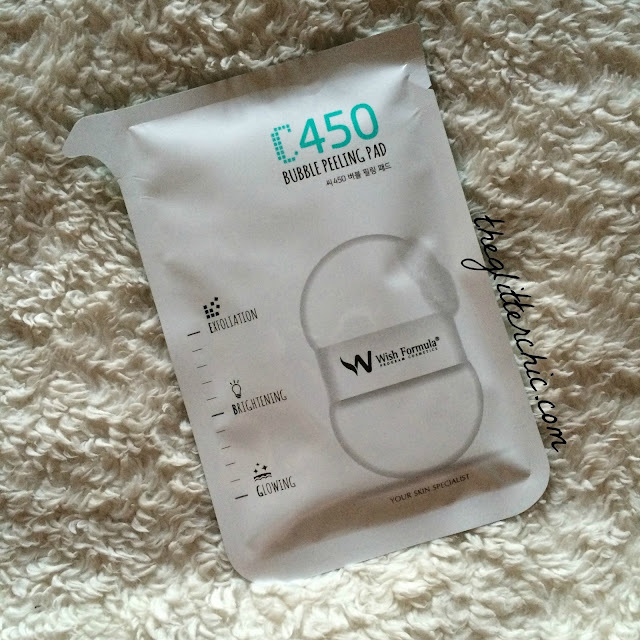 This mask helped eliminate redness in my face and was hydrating. Overall, this is a really solid box. It's full of products that I was actually excited to use, and none of the products left me wondering when I would use it, or why. Everything had a place, and was something I was able to easily incorporate into my routine. 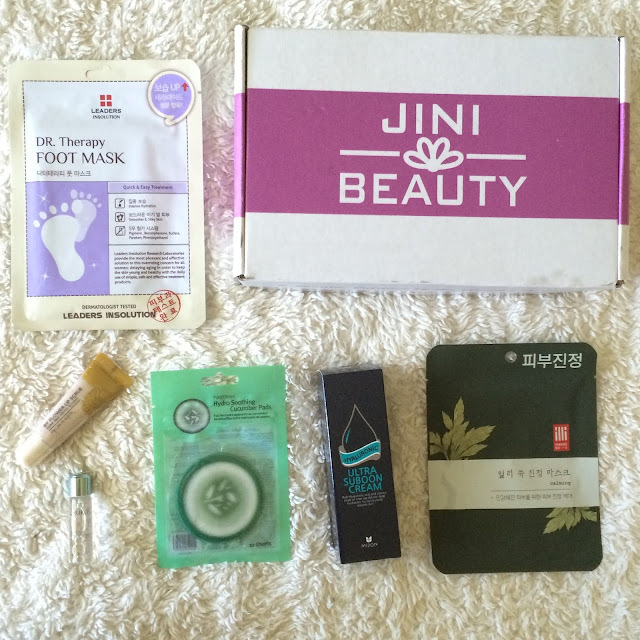 I also feel that Jini Beauty really did a spectacular job curating this boxes' products to fit a Sensitive and Troubled skin type. 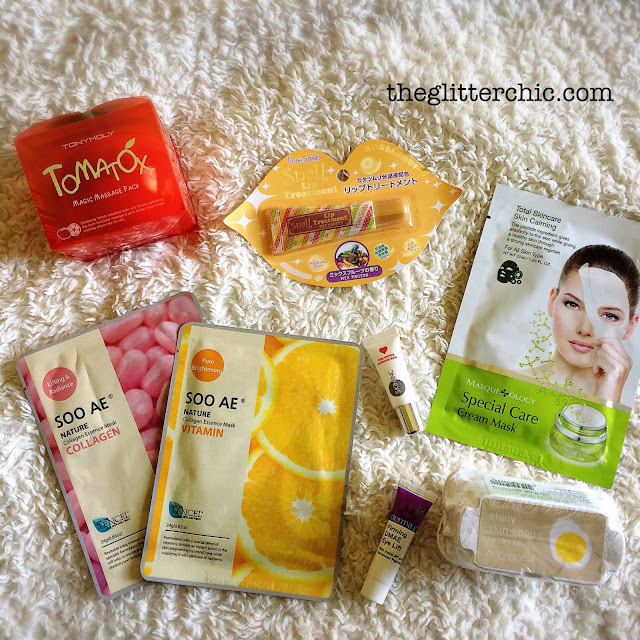 All of the items were fun to use, and helped heal my skin (aside from the lip scrub, but even that was very gentle and hydrating). This is a box I highly recommend for these reasons, and plan to purchase a subscription in the future.